There is no place like home! TE March Release Day #2! Welcome to Day #2 of Taylored Expressions March release sneak peek! Day #1 sneak peek is HERE if you like to view the post. Today I am showcasing two more new products from the March release. 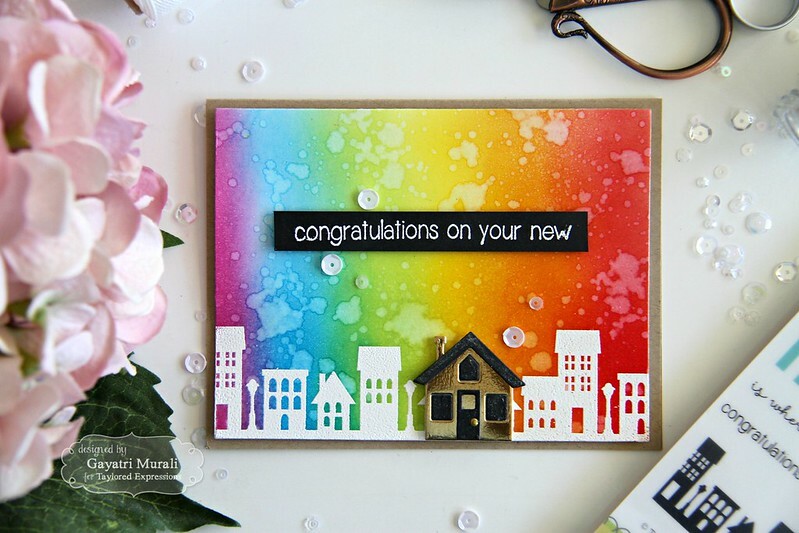 The first product I am showcasing is a stamp set called There’s No Place Like Home. This is a beautiful stamp set and coordinates well with couple of Little Bits dies new release as well. I have paired the stamp set with Little Bits – House die to make my project. I white heat embossed the border image from There’s No Place Like Home stamp set on the bottom of a watercolour paper panel. 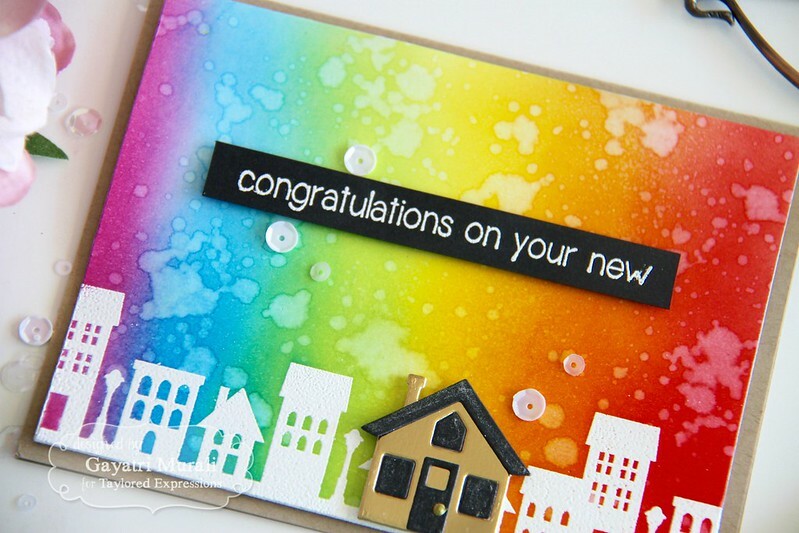 I then sponged distress inks in rainbow colours on the background and the border embossed image pops out of the colourful background. The sentiment is white heat embossed on Oreo cardstock, trimmed and adhered on the panel. To highlight the new house, I die cut the Little Bits- House die in gold mirror cardstock and Oreo cardstock and adhered on the heat embossed border covering two of the embossed houses. Then embellished with sequins from Snow Flurries collection. Here are the list of supplies used to make this card. The second new product I am showcasing today is another stamp set called Grouchy Grumplings 2. Yes, another stamp set and coordinating dies to the Grumplings series. I love it. I love that bird in the stamp set. So adorable with the grumpy face. I used the bird and sentiment to make my card. I used the clouds pattern paper from Build a Scene pattern paper pack on the background. Then die cut a Sugar Cube cardstock using the largest stitched rectangle die from Stitched Rectangle Stacklet. then used three stitched rectangle die to die cut three circle out of the panel. I sponged various TE dye inks on the stitched circles, black heat embossed the sentiment on two of them. I adhered the rectangle negative panel on the card front using foam adhesives and inlaid the sponged circle dies back in place using liquid glue. I stamped, copic coloured and die cut the bird from Grouchy Grumplings 2 and adhered on the empty circle. The card is embellished using TE enamel shapes. Here are the list of supplies used to make the card. I will see you tomorrow with day #3 of sneak peek projects. 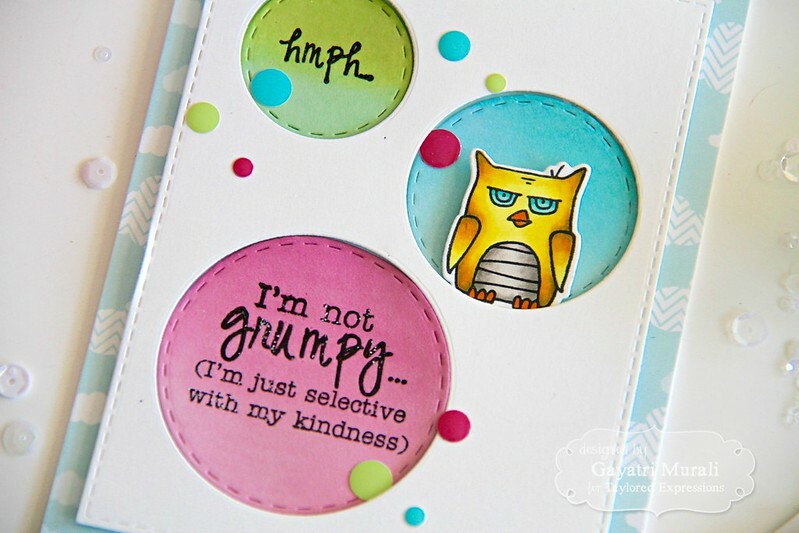 Love those stamps and your cards…how cute is the 'Grumpy Owl'?